The Marktplatz as it appears today. If you're living near or visiting Stuttgart, chances are you've visited the Marktplatz. 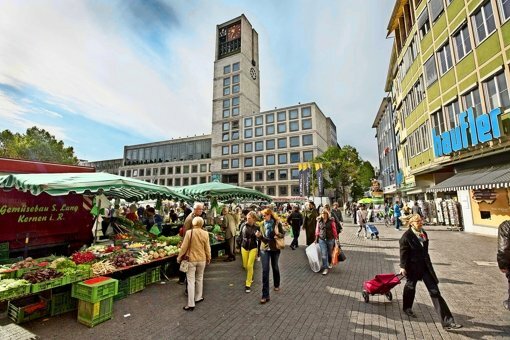 The historic Marketplace has been a scene of trade since earlier than 1283, when the then small city of Stuttgart was granted the right to hold a market by the Holy Roman Emperor. Continuing in that tradition, the Marktplatz is both the scene for 3 weekly farmers markets (Tuesday, Thursday, and Saturday, 9:00 -13:00) and a host of seasonal festivals like the Weihnachtsmarkt (Christmas Market). But hidden history lurks beneath. Bunkers to protect Stuttgart's citizens from Allied air raids during World War II were constructed all over Stuttgart, including right under the Marktplatz. The Bunker im Marktplatz was completed in June 1941 and could house 1,010 people long term, or 3,000 people in the event of an emergency air raid. 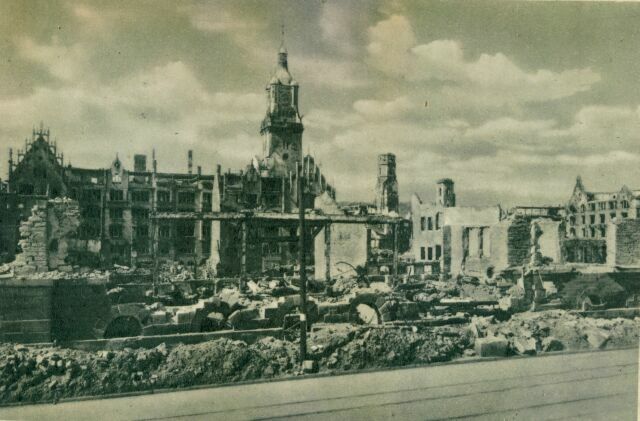 The Marktplatz after the war, with the ruins of the "Neues Rathaus". Because of the immense destruction to the center of Stuttgart by the end of the war, there was a housing shortage, let alone enough space to provide shelter for visitors. Out of 30 large hotels, only 3 survived the war, making the space available from 3,600 rooms pre-war to less than 300 by 1945. So the highly practical Swabians devised to turn their air shelter bunkers into hotels. Thus the "Bunker hotel" was born. There were actually 6 bunker hotels operating in Stuttgart after the war - in addition to the largest at the Marktplatz, there were hotels at Marienplatz, Wilhelmsplatz, Leonardsplatz, and near the Rosensteinbruke. They gradually fell out of favor as the city rebuilt into the modern form known today, but the "Hotel am Marktplatz" survived all the way until 1985, when it was closed for health and safety reasons. 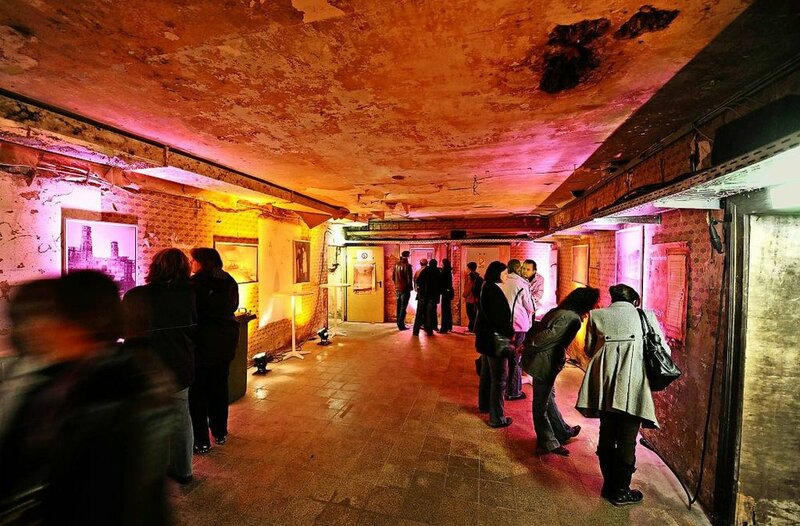 The Bunker Hotel is only open to the public one night out of the whole year! Today, this unique artifact of the war and Swabian resourcefulness can only be visited by the public one day out of the year - the famous "Lange Nacht der Museen" or "Long Museum Night". On this night, dozens of museums across Stuttgart open their doors after 19:00 for special events, tours, music, drinks, and dancing. But because of it's mystery, the line for the Bunker Hotel at the Marktplatz is always the longest. Want to make a day of it? To kick off the Spring tour season, I'll be providing a Stuttgart City Tour at 16:00 this Saturday, March 17th ending with enough time to grab dinner before the event starts. I'll point out some of my favorite exhibits of the Lange Nacht in between deep diving into Stuttgart's hidden history. Unlike most tours, you do NOT have to reserve in advance, (although you're welcome to if you wish!) so if you're feeling spontaneous, it's no issue to roll up to the meeting spot. Just be aware that tours do depart promptly. Hope to see you there!